New Year's resolutions typically deal with ways to better one's appearance or health, but what about fatherhood? 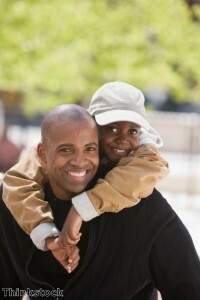 There are a lot of things that dads can do to improve their parenting skills in 2011. One of the most crucial aspects of parenting is mastering the art of dishing out both praise and criticism. It can be tough to strike a balance. Often, dads don't want to overly praise kids, but at the same time it's important to cultivate children's self-esteem. The key, sociologist Christine Carter told the news source, is to emphasize the effort they put into activities rather than the outcome. "By shaping their perspective on it, it can change how they see themselves and how they approach their activities," she told The Kansas City Star..
Dads should also be sure to place emphasis on the health of their kids in the coming year. The news outlet suggests reducing the amount of time that they spend watching television or playing the computer. Two hours or less is the recommend allotment, and encouraging at least an hour of physical activity each day is ideal. Of course, the best way for dads to encourage a healthy and active lifestyle is to lead by example.